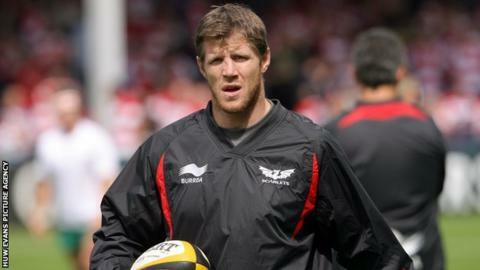 Simon Easterby has been appointed as the new Scarlets coach after Nigel Davies' decision to move to Gloucester in the English Premiership. Easterby had been part of Davies's backroom team since 2010. Davies, who had been in charge at Parc Y Scarlets since 2008, has given Easterby's appointment his full backing. "I wish Simon all the very best and he has my full support in his appointment as the new head coach," said Davies. Easterby, a former British and Irish Lions and Ireland flanker, is a former Scarlets captain and retired from rugby in 2010. Davies leaves the Scarlets to take up his new role with Gloucester Rugby with immediate effect. The Scarlets have promoted from within their own coaching set-up, with Easterby taking charge as head coach and leading a strengthened Scarlets coaching group alongside backs coach Mark Jones, strength and conditioning coach Brad Harringon and the newly appointed forwards coach Danny Wilson. Easterby played more than 200 games for the Scarlets and has become an integral part of the region's bootroom policy out West. Davies is confident he has left a lasting coaching and player legacy at Parc Y Scarlets. "During the past four years I've have worked with real intensity with a talented and committed group of ambitious coaches and players," said Davies. "I believe I leave the Scarlets on a very firm footing in terms of results, performance and the development of players and it's great to see that there will be another group of young talented players that have come through the Scarlets system getting their first caps at Wales' game against the Barbarians. "My decision is underpinned by my belief that the coaching group at the Scarlets has progressed significantly over the past two seasons. "Simon [Easterby] and Mark [Jones] with the added impetus of Danny Wilson, will create a talented, dynamic and energetic coaching environment and I have no doubt they will move it forward successfully." Legend Phil Bennett was quick to pay tribute to the departing Davies and the work he had done at the Scarlets and is confident he will be a success at Gloucester. "I think Nigel Davies has grown into the job as Scarlets coach," said Bennett. "He had two hard years to start, when the Scarlets were in the doldrums, but he gradually built a good side, not a great side, because they haven't gone that far in Europe. "He has been responsible for the likes of Rhys Priestland, George North, Jonathan Davies and Scott Williams coming through. "It is a big blow we are losing Nigel when he was really coming into his prime."